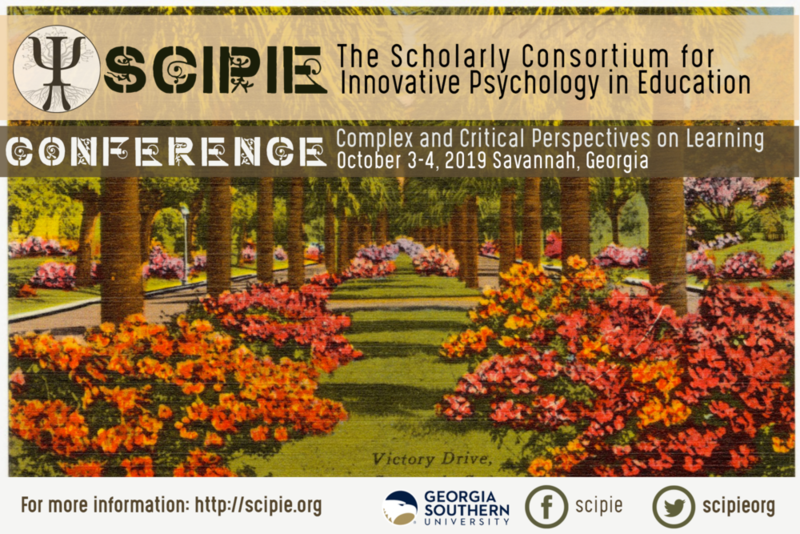 The SCIPIE board is pleased to announce the 8th biennial conference of the Scholarly Consortium for Innovative Psychology in Education (SCIPIE)! The conference is sponsored by the Georgia Southern University College of Education. It will be held on October 3rd-4th 2019 at the Embassy Suites by Hilton Historic Savannah in downtown Savannah. The theme of the conference will be, Critical and Complex Perspectives on Learning. Conference proposals are due July 1st 2019 and can be submitted via the conference submission system. The conference will be held in conjunction with the executive committee board meeting of Division 15 of the American Psychological Association. It is a special privileged to collaborate with the leadership of APA division 15 for the weekend! 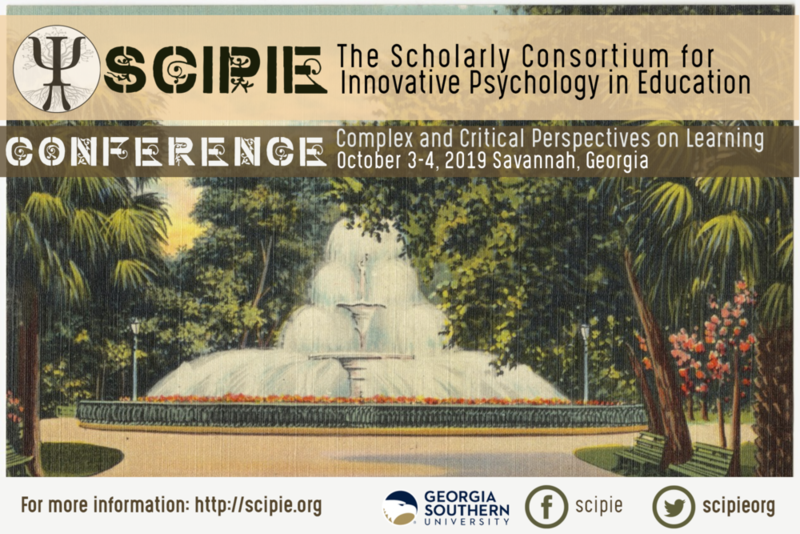 SCIPIE conferences traditionally focus on complex problems found at the intersection of education and psychology. The emphasis is on driving theoretical and methodological innovation through exploration of tensions in educational psychology and related fields. SCIPIE offers a unique conference experience due to its interactive structure. Participants are encouraged to bring works in progress and unresolved research issues as a foundation for session content and discussion. The conference is also geared specifically to provide early career scholars and graduate students an opportunity for meaningful participation in conference sessions. The conference will be held at the Embassy Suites Savannah. In the heart of Savannah, the conference hotel is within walking distance from many wonderful restaurants, eateries, and bars, the SCAD Museum of Art, the Telfair Museums, the Chatham County Courthouse, and many historical sites. This hotel is also within close proximity of Georgia State Railroad Museum and Savannah Visitor Center. Wired and wireless Internet access is complimentary, and the hotel contains recreational opportunities including an outdoor pool, a spa tub, and a fitness center. A complimentary cooked-to-order breakfast is served daily from 6 AM to 10 AM. The focus for the 2019 conference will be exploring complex and critical perspectives on psychological processes in education in order to reimagine existing strands of research and generate new trajectories for the field. Like our host city for SCIPIE 2019, the field of educational psychology has a rich yet contentious history. The turn of the century brought new challenges and opportunities for the field, as well as new questions: How will we organize ourselves for continuous generativity and principled innovation in educational psychology? How can we honor intersectionality and enrich our interdependencies with the larger field of educational research? What new commitments should educational psychologists make to the society we seek to serve? How can we uniquely contribute research that can inform emerging innovations in learning? We welcome all proposals, including proposals that push theoretical and methodological boundaries related to human learning, thinking, affect, motivation, and behavior in formal and informal educational contexts, especially those with a direction related to the theme of critical and complexity perspectives on learning. Two areas where educational psychology has begun to make advances is by recognizing the underlying complexity of educational phenomena, as well as the ideological, cultural, political, and historical forces that shape power and privilege embedded in our understanding of learning. Educational psychologists increasingly recognize that phenomena in educational psychology manifest at multiple levels of analysis (e.g., intra-person, intra-group, inter-person), each with their own domain specific, contextual influences and patterns of change. Yet, we continue to wrestle with aligning theories and methods that fully appreciate phenomena of interest as fundamentally complex, that illuminate the processes and dynamics of learning, interdependencies among levels, and describe complex, dynamic, and emergent processes of learning. Furthermore, pressing current and future issues of education compel us to seed new conversations about power and opportunity. We invite sessions that connect traditional educational psychology constructs to critical and sociocultural perspectives to explain psychological processes in social context; for example, critical and post-structural race theories, queer theory, settler-colonial theory, and critical pedagogy as approaches to examining the role of social, cultural, and political factors in studies of psychology in education (including implications for theory and methods), process-oriented accounts of how individuals' broader social and cultural lives inform educational activities, process-oriented accounts of how individuals interface with the group/collective level, and equity and social justice implications for researchers and/or practitioners. Conference participants can register for the conference at our conference registration page. The conference registration includes a biennial conference membership, lunch both days of the conference, and entry into the poster session happy with two free drink tickets. The cost of registration is $100.00 for graduate students and $200.00 for faculty member and and other educational professionals. SCIPIE offers an opportunity to find new ways to address challenges in research, explore complex problems, and examine the ambiguous space between scholarly rigor and meaningful application. We place a high premium on interactive conference sessions that promote engaging dialogue and active participation. We also seek to provide meaningful conference experiences for graduate students. Each year, we organize a graduate student poster session. Graduate students are paired with a mentor from the field and receive mentoring feedback on works-in-progress or completed research. To meet these aims, the two-day conference will consist of sessions designed to facilitate critical discussion of issues and assumptions related to core constructs and models in educational psychology. SCIPIE invites participation through multiple session formats. These formats are divided into two categories 1) collective submission types where groups of researchers propose sessions collaboratively, and 2) individual submission types for graduate students to submit research posters and faculty to submit single papers to be integrated into interactive sessions. Experiential Learning Sessions: Experiential learning sessions are collaborative in nature and include formats such as workshops, demonstrations, and professional development. They can be methodological (e.g. statistical or coding demonstrations), or researchers can develop sessions that address difficult problems or unique solutions in educational psychology that call upon audience participation to explore the topic. We also encourage submissions around topics in the field that require debate or dialogue (e.g. addressing school violence). We encourage researchers to be creative in their thinking about not only what issues to address, but also how to create interactive sessions that are engaging for conference goers. Each session will last one hour and fifteen minutes. See below for submission instructions. Interactive Paper Sessions: Interactive paper sessions will be composed of collections of research papers that share a common goal, theme, or method with the goal of synthesizing emergent research in educational psychology. Researchers are encouraged to collaboratively develop sessions that highlight forward-thinking work that can promote or inspire meaningful change. We encourage researchers to not only consider ways to group papers, but also to be creative about how to actively involve participation among audience members. If at all possible, we would like to avoid back-to-back power point presentations with a passive audience. Each session will last one hour and fifteen minutes. See below for submission instructions. Graduate Student Posters: We invite graduate students to propose poster presentations for the graduate student poster reception. Graduate students may present research related to their thesis or dissertation, collaborate on new ideas with other graduate students, or present work they have done in collaboration with faculty. The emphasis of the reception is on student work. A student must be first author on the poster. Where appropriate, faculty may be listed as co-authors. We encourage graduate students to highlight potential innovations, showcase complex problems, and explore possible research agendas in their poster submissions. Participants will be matched with a poster mentor as part of the SCIPIE experience. See below for details on poster mentors and submission instructions. Individual Paper Submissions: We invite researchers who would like to attend the conference but are not a part of a collective submission to submit individual papers for presentation. Individual paper proposals should be led by and submitted by faculty members. Graduate students should submit to the poster session (but they can be listed as a coauthor on individual papers). Ideally, individual paper submissions should be fully developed, with data, method, or models in place. The papers should represent innovations in educational psychology that are related to the conference theme. These submissions will be grouped with other, similar proposals to create complete a session. SCIPIE officers will be in charge of grouping paper sessions and working with authors to create interactive sessions related to the emergent themes. See below for details on submission instructions. All proposals should be submitted electronically to the electronic SCIPIE submission system by midnight on Monday, June 3, with notification by Monday, July 1. The electronic submission system will contain several fields that need to be completed. Be prepared to enter the following information into the electronic submission form. Contact information. Contact information will be required for all participating authors including first and last name, affiliation, and email address. Please prepare a list ahead of time. Submission type. The authors will need to identity the type of session planned for the conference. This will be indicted using a drop down menu. Submission summary. Authors will need to prepare a 500 word summary of the session or paper submission that includes a description of the content that will be addressed. The summary should include the foundational questions and the desired outcomes. Also, be certain to highlight critical details such as relationship to conference theme, theoretical framework, data collection tools or methodologies that will be discussed, and potential impact. Collective session activity description. Authors will need to prepare a 200-word summary of how sessions will actively engage participants and involve them in the presentation (not required for posters). Individual submission innovative paper description. Authors will need to prepare a 200-word summary of how their poster or individual paper contributes to innovation in educational psychology (not required for collective sessions). Poster Mentor Sign ups! If you are an experienced faculty member, we invite you to get involved with the conference by signing up to work with a student. For this important service opportunity, poster mentors will provide one-on-one research mentoring for the poster authors during the course of the conference. The Coveted Founders Award! In honor of the 10th anniversary of SCIPIE, the board established the inaugural SCIPIE Founder’s Award in 2015, a special tribute to the most creative and interactive session format. Carrying on that tradition, we are looking for another innovative session to honor in 2019. Self-organized Lunch Topics. We cherish the working nature of SCIPIE. Thus, we are imagining new opportunities for conference dialogue that will help set direction for the field. At the end of the submission form, we will ask you to provide your input related to ideas for “self-organized lunch topics.” It is the tradition of SCIPIE to include lunch with registration on both days of the conference. This year, we invite registrants to offer up ideas for self-organized lunch topics that can spawn engaging and important lunch dialogue. A Great Conference Venue! The 2019 conference will be held at Embassy Suites by Hilton in historic Savanah. Savannah is a beautiful city with a variety of opportunities for conference goers! Registration and hotel reservations are now open with a special conference rate available!